Achievement wins applause. And when the steps toward achievement are tinged with mystery, romance, or daring, the applause is irresistible and continuous. So it has come to pass that by the side of Xenophon's masterly "retreat of the Ten Thousand," of Cortes's burning his ships at Vera Cruz, and of Marlborough's bold march through the heart of Germany to the victory at Blenheim, stands Sherman's March to the Sea and his "Christmas Gift" of captured Savannah. And yet this brilliant leader of men had never seen a hostile shot fired until he was forty-one, and his first battle was the defeat at Bull Run. The March to the Sea, upon which Sherman's fame as a soldier so largely rests, was by no means the greatest or most significant of his many achievements. His record as a soldier is filled with examples of his courage, his shrewdness, and his tenacity, while his mingling of gentle ways and grim determination, of restlessness and calm, of forethought, fearlessness, and frankness, make him at once a unique and central figure in the decade of war and reconstruction that forms so important a chapter in the story of the United States of America. William Tecumseh Sherman was born on February 8, 1820, in the town of Lancaster, the county-seat of that fair and fertile section known as Fairfield County, in the southern part of the State of Ohio--the busy commonwealth that furnished 300,000 men to the armies of the Union, and gave to the Civil War its three greatest generals; for Grant and Sherman were Ohio born, and Sheridan's boyhood was spent in the same State. But Sherman's ancestors were of stout Puritan stock, dating back almost to the days of the Mayflower. His first American "forebear" was a Puritan minister, Rev. John Sherman, an emigrant to the Connecticut colony from Essex in England. Of one of the collateral branches was Roger Sherman, drafter and signer of the Declaration of Independence. The father of the soldier was Judge Sherman, of the Ohio Supreme Court; his mother was "a Hoyt of New England." William Tecumseh Sherman was the sixth of eleven children, a younger brother being the lad who, later, became Senator John Sherman of Ohio. Judge Sherman, the father of the boys, died in 1829, and William was adopted into the family of Senator Thomas Ewing, of Ohio, a resident of Lancaster, and a notable figure in American history, for he was senator and cabinet minister for nearly forty years. Sherman's training was that of a soldier from boyhood. At sixteen, he was entered as a cadet at the Military Academy at West Point, from which he graduated in 1840, standing sixth in a class of 42. Engineering was his favorite study, but devotion to his books seems not to have kept him out of mischief. He was not, he himself admitted later, "a Sunday-school cadet," his record for behavior being 124 in the Academy standard--not so very far from the foot. But Grant, it must be remembered, ranked even lower in his behavior record, standing at 149. The twenty years that followed Sherman's graduation from West Point were variously spent. He was commissioned second lieutenant in the Third Artillery, July 1, 1840, and ordered to Florida to face the hostile Seminoles. He was promoted to be first lieutenant November 30, 1841, and in 1842 was ordered to Fort Morgan, in Alabama. From 1843 to 1846 he was stationed at Fort Moultrie, in Charleston Harbor (where the afterward famous Major Robert Anderson was his superior officer), at Bellefontaine, Alabama, and at Pittsburg, in Pennsylvania, on recruiting service. When the war with Mexico was declared, Lieutenant Sherman was sent to California, then a debatable land. He reached Monterey Bay, by way of "the Horn," in January, 1847, and spent three years in California, returning east as bearer of despatches to the War Department in 1850. In May, 1850, he married Miss Ellen Ewing, daughter of Senator Ewing, then Secretary of the Interior under President Taylor, and in September following he was commissioned as captain and sent to St. Louis. It was at this time, so Sherman notes in his "Memoirs," that he felt a great disappointment to think that the war with Mexico was fought to a finish without his having been "in it," and he adds, "of course, I thought it was the last and only chance in my day, and that my career as a soldier was at an end." It was at an end for a time, for after garrison duty at St. Louis and New Orleans, he resigned from the army, and, in 1853, sought to make his fortune in business. He first went to California as manager of the San Francisco branch of a St. Louis bank, but the ill success of the enterprise drove him east again in 1857, when he engaged in the banking business in New York City. To this enterprise, however, the famous panic of 1857 put an early end, and in 1858 he was embarked in the law, with an office at Leavenworth, Kan. This, too, failing to supply sufficient bread and butter, he tried farming in Ohio for a while, and then applied for a government position in Washington. Instead of this, however, he secured an appointment as Superintendent and Professor of Engineering in a new military college just started at Alexandria, in Louisiana. He entered upon the duties of his position on the 1st of January, 1860, when the mutterings of rebellion were already abroad; and just as he had put the academy into good working order the war-cloud became so black that Sherman, in a manly letter to Governor Moore, of Louisiana, declared his intention of maintaining his allegiance to "the old constitution as long as a fragment of it survives," resigned his office, and returned to Ohio. In April, 1861, he accepted the presidency of a St. Louis street railway company. Then Sumter was fired on, the war fever filled the land, troops were hurried to the front, and Sherman signified to the Secretary of War his desire to serve his country "in the capacity for which I was trained." On May 14, 1861, he was appointed colonel of the Thirteenth United States Infantry, and assigned to inspection duty in Washington under General Scott, the commander-in-chief; and then the real story of his life began. At first fate seemed to be against him. He was too outspoken and hard-headed to suit the reckless and effusive boasters of those early days of the war, which he insisted would be long and bloody, unless the whole military power of the Republic was put into the field to crush the rebellion before it could grow into a revolution. He was as disgusted as Washington had been in revolutionary times, with short-service enlistments, and refused point-blank to go to Ohio to enlist "three-months men," saying, in his blunt way, "You might as well try to put out fire with a squirt gun as expect to put down this rebellion with three-months troops." He was assigned to the command of the Third Brigade of the First Division of McDowell's army, and had his "baptism of fire" upon the disastrous field of Bull Run, which he has characterized as "one of the best planned and worst fought battles of the war." That famous "skedaddle," as it was the fashion to call it, he frankly admitted, in his official report, began among the men of his brigade, and the "disorderly retreat" speedily became a humiliating rout, which only a few cool-headed officers, such as Colonel Sherman, could check or control. The chagrin over the stampede at Bull Run was so great, that the more conscientious Union officers expected to be held responsible for it and duly court-martialed; but to Colonel Sherman's surprise, his superiors saw beyond the demoralization of the moment, and in August, 1861, he was made brigadier-general of volunteers and transferred to the Department of the Cumberland, with head-quarters at Louisville, Ky. From thenceforth all his fighting and all his fame was associated with the armies of the West. At once he saw the desperate condition of affairs in Kentucky--a border State, only to be held for the Union by prompt and decisive measures. He called for reinforcements frequently and emphatically, and when the Secretary of War visited him on a tour of inspection, and asked his views on the situation, Sherman paralyzed him by asserting that for the defence of Kentucky, 60,000 men were needed at once, and that 200,000 would be necessary there before the war in that State could be ended. This was so out of proportion to the Secretary's estimate that Sherman was declared crazy; he was deprived of his command at the front and relegated to a camp of instruction near St. Louis. But so shrewd and correct an observer, so energetic a leader, and so determined a fighter, could not long be left in retirement, and in February, 1862, General Sherman was ordered to assume command of the forces at Paducah, Ky. Desperate fighting soon followed. The battle of Shiloh (sometimes called Pittsburg Landing) showed of what stuff the "crazy Sherman," as the newspapers had called him, was made, and from Shiloh's bloody field in 1862, to Johnston's surrender at Raleigh in 1865, Sherman's fame rose steadily, until it left him one of the three greatest generals of the Civil War, and one of the famous commanders of the century. From Shiloh to Raleigh, Sherman stood, in a measure, as Grant's right hand, for, even when Grant was "hammering away" in Virginia, Sherman, by his strategy, shrewdness, and daring in the West was giving him material support and help. In the three years of fighting, from 1862 to 1865, these events stand prominently out in Sherman's military record--the tenacity with which he held the right of the line at Shiloh, the faithful service he rendered as commander of the left before Vicksburg, his rapid relief of Knoxville, his brilliant capture of Atlanta, his daring and famous march to the sea and the capture of Savannah, his equally daring march through the Carolinas to the help of Grant, and his final capture of Johnston's army, which was the real close of the war. In all these events the peculiar traits of character that made Sherman so conspicuous a success stood out in bold relief--his coolness in danger, his bravery in action, his daring in devices, his readiness of invention, his electric surprises, his scientific strategy, his ruthlessness in destruction, his courtesy to the conquered, his devotion to his soldiers, his loyalty to his superior in command, his restlessness, his energy, his determination to succeed. These all contributed to the result that made "Sherman's army" famous the world over, and stamped him as the hero of a campaign that, according to military critics, "stands alone in the history of modern warfare." His scientific fencing with General Joseph E. Johnston, the Confederate leader, was as masterly as it was effective. He forced his rival from the stand he had taken as warder of the gateways to the South's supply land, fighting him step by step from Dalton backward to Atlanta, and capturing that stronghold of the Confederacy by persistent and desperate fighting. Then, when Atlanta was won, Sherman's ability to cut the Gordian knot, as no other man dared, was displayed with especial force. 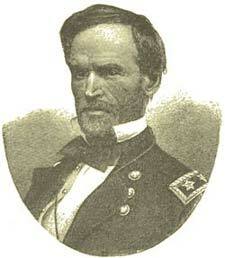 Instead of frittering away his precious time by simply holding Atlanta, or wasting strength unnecessarily by hunting up a baffled and elusive foe, or devoting all his energy to keeping open his long line of communication and supply, he determined to strike a disastrous blow at the Confederacy, swiftly and unexpectedly. Cutting loose from his connection with the West, he would live on the enemy and lay waste the storehouse of the Confederacy--or, as he expressed it in outlining his plans to General Grant, "move through Georgia, smashing things, to the sea." The boldness of this desperate measure at first attracted, as it afterward alarmed, the authorities at Washington. Consent was given and then recalled, but, before the recall could reach him Sherman had acted quickly, fearing this same countermand. Upon receipt of the order consenting to his march, he cut the telegraph wires to the north, then he burned his bridges, tore up the railroad that connected him with the West, and, with his army reduced to its actual available fighting strength of 60,000 men, with banners streaming, gun-barrels glistening in the sun, bands playing, and the men singing lustily "Glory, glory, hallelujah!" Atlanta was left behind, and "Sherman's army" set its face eastward and commenced its memorable march to the sea. In two parallel columns the army of invasion and destruction moved through the fertile land, cutting a swath of desolation forty miles wide, and crippling the Confederacy by dissipating its most cherished resources. For fully a month the army was practically lost, so far as communication with the North was concerned. Then it struck the sea at Savannah, captured that beautiful city, and, in the celebrated despatch which actually reached President Lincoln on Christmas Eve, General Sherman presented to the President and the country "the city of Savannah, as a Christmas gift." Savannah taken, the more difficult march northward was determined upon, so as to make a junction with Grant before Richmond, and end the war by one final and tremendous stroke. The "Campaign of the Carolinas," as this northward march was called, was a really greater achievement than the march to the sea, for it was against more formidable natural odds, and was done in midwinter. The distance covered, from Savannah to Goldsboro, in North Carolina, was four hundred and twenty-five miles; five large rivers were crossed, three important cities were captured, and the Stars and Stripes were once more flung to the breeze above the ruins of Fort Sumter. And yet, in fifty days from the start, the army reached Goldsboro, "in superb order," and concluded what Sherman himself designates as "one of the longest and most important marches ever made by an organized army in a civilized country." It was a great achievement, but it was without the novelty, the mystery, and the dramatic qualities of the earlier cross-country campaign, and so it has come to pass that the first has been the most famous, and Sherman's march to the sea has gone into history as one of the romances and glories of the War of the Rebellion. The campaign of the Carolinas fitly ended, as had the march to the sea, in victory; and the successes at Averysboro and Burtonville culminated on April 26, 1865, in the surrender, near Raleigh, of Johnston, and the last organized army of the Confederacy. The war was over. Sherman's army marched northward to Washington, where, on May 24, 1865, on the second day of the famous Grand Review, General Sherman and his victorious army marched past the presidential reviewing stand--"sixty-five thousand men," says General Sherman, "in splendid physique, who had just completed a march of nearly two thousand miles in a hostile country." Then came the disbandment; Sherman bade his "boys" good-by in a ringing farewell order; the men departed to their waiting homes, and the splendid "Army of the West" was a thing of the past. After the conclusion of the war General Sherman was, for four years, stationed at St. Louis, as Commander of the Military Division of the Mississippi. He was a notable public character, with a reputation for bravery that none dare assail, and a record as a soldier that made him one of the nation's heroes. He stood next to Grant in position, merit, and popularity; and when, in 1869, General Grant was elected to the presidency, Sherman, who had been named lieutenant-general in 1866, was promoted to the vacant post as general of the army, with head-quarters at Washington. He visited Europe in 1871-72 and, both because of his own brilliant record, and his official position as head of the American army, he was everywhere received with honor and distinction. Returning home he wrote his "Memoirs;" they were published in 1875, and stamped him, in the opinion of critics, as "by far the ablest writer among America's military men." On February 8, 1884, he was placed upon the retired list--"turned out to grass," as he expressed it, "and told I could spend the rest of my days in peace and retirement." As an especial mark of the nation's pride in his record, he was, as the order stated, "placed upon the retired list of the army, without reduction in his current pay and allowances," and the President in the same order publicly put on record the gratitude of the American people "for the services of incalculable value rendered by General Sherman in the War for the Union, which his great military genius and daring did so much to end." It was a fitting tribute to the man who had worn the uniform of his country for forty years, faithful to every trust and equal to every emergency, and who had risen through every grade from a cadetship and a lieutenancy, to the proud eminence of General of the Armies of the United States. The twenty-six years that were his after the close of the great struggle in which he had been one of the central figures, were filled with a quiet enjoyment of life and a wide personal popularity. Wherever he went he was a living hero, welcomed and honored as such by the people who owed so much to his wise brain and his unsheathed sword. He could have been President of the United States, had he been willing to accept the nomination that was offered him; instead, he declined with peremptory and characteristic bluntness, and he is, it is believed, the only man who ever did refuse that high office. After his retirement he made his home, first in St. Louis and then in New York, where the last five years of his life were passed, and where he speedily became one of the great city's familiar, honored, and notable figures. Here, too, the final call came to him. On February 14, 1891, when he had just passed his seventy-first birthday, sounded the order "parade is dismissed," and Sherman died in his own home, in West Seventy-first Street, mourned by an entire nation. He was buried in St. Louis by the side of his wife, who had died in 1890. William Tecumseh Sherman was, in the strictest sense of the word, a soldier. His bearing and presence told of camp and uniform. With a military education and military environments, he could not understand, and could not calmly brook, the cautious conservatism of the civilian, which would often temporize when swift, determined action seemed necessary, and which was often boastful at home, and timorous in the field. Able in action, fierce in assault, unerring in judgment, watchful in detail; with a sagacity and foresight that amounted almost to genius, and a memory that was marvellous, General Sherman was a great military leader, and one who, when the opportunity came, rode straight into fame and reputation. As determined as he was daring, as magnanimous as he was impulsive, as clear-headed as he was energetic, and as gentle-hearted in peace as he was ruthless in war, he was indeed a unique figure in America's history, and, as time goes on, his name will stand as that of one of the great Republic's most famous men and most cherished memories.